Fred. 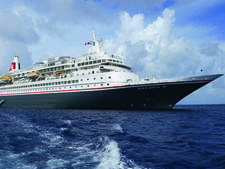 Olsen Cruise Lines' flagship Balmoral is the largest ship in the four-strong fleet, yet is still small enough to navigate size-restricted waterways such as the Kiel Canal and offer a personal cruising experience to its 1,350 passengers. A stylish and friendly newly-refurbished vessel with high levels of personal service geared toward mature British travellers. Old-style fixed dinner times in main restaurants. Classic small ship cruising with a fresh new look. 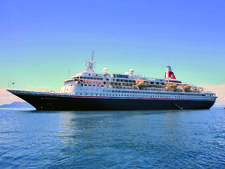 Balmoral was launched in 1988 as Crown Odyssey, originally constructed for the Royal Cruise Line, and was operated by Orient Lines and Norwegian Cruise Line before being bought by Fred. Olsen in 2007. When it joined the fleet it was "stretched", with a 99-foot section added midship. However, it retains the classic lines of what many traditionalists would deem a "proper" old-style cruise ship. This, combined with the onboard service and intimate atmosphere, is what draws loyal passengers back time after time -- many saying they would never travel on a big ship or with another cruise line. Catering mainly to Brits, the ship provides a friendly, home-from-home atmosphere in increasingly stylish surroundings following Balmoral's extensive refurbishment in December 2017, which is part of an ongoing multi-million fleetwide upgrade. The majority of cabins have been completely redecorated and fridges and smart TVs added to every stateroom. The Grill speciality restaurant has been moved to a standalone venue and other new additions include a gelato bar. There have been other improvements throughout the ship, too, and more will take place when Balmoral re-enters dry dock in winter 2019, including the addition of the popular Oriental Room tea lounge currently found on Fred. 's Black Watch and Boudicca. Solo travellers are offered a warm welcome with a higher-than-average choice of solo cabins, including balcony cabins, and special events such as social gatherings and teas. The ship generally attracts a mature crowd who enjoy a mix of peace and quiet (ship announcements are kept to a minimum), lectures and a full programme of daily entertainment and excursions. However, that doesn't mean Balmoral is staid. There are sing-a-longs and karaoke in the lively pub and shore tours include plenty of active options. Food is a mix of British fare and global cuisine and bar prices are extremely reasonable; possibly another reason why passengers are so happy. Balmoral offers a mix of ex-U.K. sailings from Southampton, Newcastle and Rosyth and fly-cruises, with 2020/21 itineraries ranging from one-night taster cruises to a 70-night South American voyage. Balmoral has a strong and loyal base of regular middle-aged to retired passengers; some of whom travel only with Fred. Olsen. The passengers may generally be mature, but they are lively and enthusiastic and throw themselves wholeheartedly into shore excursions that range from standard city walking tours to some exciting and unusual activities. On our Spain, Portugal and Madeira sailing these included a RIB boat whale and dolphin watching excursion, an evening tour in motorbike sidecars and even the chance to drive your own electric-powered bubble car around the streets of Funchal. The onboard nationality is predominantly British, but the ship also attracts a smattering of mainland European, American and other nationalities. Fred. Olsen isn't an adult-only line, but it’s not known for its children's programmes, and wouldn't be a natural choice for families, particularly those wanting water parks and a jam-packed schedule with small sailors in mind. However, children aged six months and over are welcome on ships and at certain times of years, such as school holidays, you can expect to see families -- often three generations -- onboard and a kids' club is laid on. The dress code on Fred. Olsen is designed to make passengers feel relaxed and comfortable. During the day, the accent is firmly on casual wear, such as T-shirts or polo shirts teamed with shorts, light-weight trousers or skirts, plus a sweater or fleece depending on the temperature. Passengers wear bathing costumes, or shorts and T-shirts, paired with flip flops and sandals for lounging by the pool. Cruisers are asked not to wear vest tops or swimwear in the restaurants at lunchtime; however shorts and T-shirts are acceptable. Similarly, casual attire is worn on shore excursions. Layers, including a light rain jacket, are best in destinations where the climate can be changeable and comfortable walking shoes are always a must. For shore tours that include visits to churches, museums or cathedrals, it is advisable to dress a little more conservatively. Most evenings are denoted as "smart casual". For men, this could be trousers, chinos or smart jeans, coupled with a polo shirt or shirt. Some passengers prefer to wear a jacket or tie which is also fine. Ladies' dress can range from tailored trouser suits and stylish dresses to casual separates and summer dresses; again, the emphasis is on what individuals feel most comfortable wearing. However, trainers, T-shirts, shorts and tracksuits are not allowed in the restaurants for evening dining. Depending on the length of your cruise there will be one or more "formal" evenings on sailings of more than six nights -- usually one on a week-long cruise and two or three during a two-week itinerary. Most men opt to wear either a dinner jacket, or dark suit and tie, whilst ladies dress to impress in cocktail dresses, full-length ball gowns or evening suits. For passengers that prefer not to dress up on formal nights, Balmoral offers the Palms Cafe buffet restaurant where the dress code is "smart casual" every night. There are also some optional theme nights, and most cruises of five nights or more have a patriotic "British Night" which proves hugely popular. Passengers are encouraged to put together a red, white and blue outfit, wave Union Jacks and sing-a-long during a night of British-themed food, music and entertainment. Gratuities are charged at £5 per person, per day for passengers aged 12 and over. This amount is shared equally between cabin stewards and waiters and will be automatically added to your onboard account. Gratuities are voluntary, and can be adjusted or removed completely at guest services. Passengers are welcome to tip members of staff individually and also have the option to pre-pay gratuities up to five days prior to departure. There is no gratuity added to bar bills -- and drinks are very reasonably priced -- and tipping is optional in the spa with a space left on the receipt if anyone wants to add a tip. The onboard currency is the British pound. Boudicca is for an older set of cruisers who enjoy small, classic ships in a proper and cosy British setting without the distractions of a big ship. 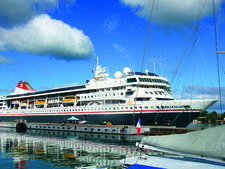 Braemar is one of the most welcoming cruise ships you're likely to experience. Wherever you sit, you're almost guaranteed to engage in pleasant, warm conversation. Built in Finland, this ship started life in 1972 as Viking Star and, at the time, was regarded as one of the most luxurious cruise ships in the world.